Sri Swami Pavitranandaji Maharaj was the first president and trustee of the Divya Jivan Sangh. Having a keen desire to establish Sivananda Ashram at Ahmedabad, he worked hard to procure the present site of four acres of land from the government of India for the Divya Jivan Sangh. With the grace of Sri Gurudev his wish was fulfilled with establishment of the Sivananda Ashram at Ahmedabad in 1975. His great perseverance and vision culminated into the construction of the Saint Kutir, Sadhak Seva Kutir and Yajna Shala. The seeds for ashram to become a major center of spiritual and religious activities were sown. Born in a religious Brahmin family at Vadodara on October 11, 1919 and in due course he acquired degrees in Arts and Law. He started his vocation as a banker with the Bank of Baroda where he excelled in this career because of sincerity, and dedication and soon became manager. Eventually he retired in 1978. In 1952 he was inspired on seeing the photograph of Swami Sivanandaji Maharaj in the temple of Lord Siva at Kachholi, a small village in South Gujarat. He read some of His books that ultimately drawn him to Rishikesh where he had Darshan of Gurudev who initiated him with Mantra Diksha to pursue his spiritual quest in orderly manner. Soon after this, he surrendered himself to the ideals of the Divine Life Society. He took great interest in publishing Sivananda Literature, through “Sivananda Sahitya Prachar Samiti”. The Samiti managed to translate about one hundred books written by Gurudev. In the year 1987, the centenary of Sri Swami Sivanandaji Maharaj, Sri Swami Chidanandaji Maharaj initiated him in the order of Sannyasa with Yogapat (Name) Swami Pavitrananda Saraswati. For him this was the ultimate goal. Then he was always busy with the activities suggested by Gurudev. 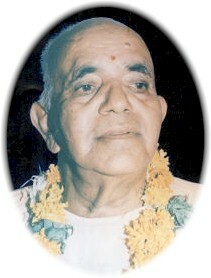 On 7th Sept 1993, while conducting an evening Satsang, he suddenly entered into Mahasamadhi with Gods name on his lips. His life was work of art with picture perfect finish. Samadhi ceremony of Swamiji was performed on 8th September, the birthday of Sri Gurudev. On that spot today we see the temple of Lord Viswanath Mahadev. His one memory, a pair of a Silver Paduka blessed by Gurudev is at present in the Sivananda Ashram, Ahmedabad. On every Thursday, “Paduka Poojan” takes place. It is a source of great inspiration to the devotees.